Let me tell you about when I started using meditation for sleep. For three years at university I didn’t sleep at all. I lay awake at night staring at the ceiling, my eyes red and dry, my mind empty yet somehow full at the same time. Eventually I started using meditation for sleep (I used a combination of meditation and these mantras). What I learned at that time was that there is a fascinating link between And I learned that there is a fascinating link between the two. When I started using meditation for sleep it totally solved my problem. For years I had terrible insomnia. This was way before I even knew you could use meditation for sleep. The few times I did sleep I suffered from sleep paralysis–an inability to move or speak when you’re falling asleep or waking up (sleep paralysis is brutal). Basically, it was hell trying to get to sleep. Desperate to sleep, I tried everything. Seriously. And finally I used meditation techniques for sleep. Sleep meds don’t work. They just hurt. You’re much better off using meditation for insomnia instead. Science shows that one of the best ways to get to sleep is by using self healing meditations. A clinical trial (4) took 49 insomniacs. Half the group were taught mindfulness. The other half completed a sleep education course. After six sessions, the group that had practiced mindfulness meditation got to sleep far easier than the other group. This is serious evidence. It suggests that using meditation for sleep is better than most other solutions. The Associated Professional Sleep Societies (5) looked at 11 research papers on insomnia and concluded that Kriya Yoga (a type of meditation) led to significantly improved quality of sleep (based on subjective analysis). And in perhaps the most surprising scientific test, researchers found that people who meditate require less sleep than others. This, however, needs clarification. Because there are conflicting studies. Some studies show that people who meditate may need up to 4 hours less sleep every night (6). Other studies suggest you need eight hours of sleep no matter what. So, basically, you want to start using meditation for sleep. Period. The best way to cure chronic insomnia is by using some meditation techniques for sleep right before bed. When you go to bed do you start thinking and worrying, right? And it seems like if you could just stop worrying, sleep would be a lot easier, right? Do you feel like you could get to sleep if only you could stop thinking too much. This is where you can use insomnia meditation techniques for sleep problems. The vast majority of insomnia cases are caused by noise. That could be mental noise from thinking too much or it could be the noise of the people above you playing Call of Duty at ten thousand decibels. Either way, insomnia is generally caused by mental or environmental noise (8). Often these two things go hand-in-hand. When I was in university I fought the environmental noise of the people above me playing video games until 5 o’clock in the morning. And I had mental noise because I was angry about it. There was next to nothing I could do about the environmental noise (ear plugs are not an option for me). But I could cut out the mental noise by using meditation to stop anger. (this is excluding more serious conditions like asthma, arthritis, chronic pain, and endocrine problems). Meditation stops all these problems. As you can see, a large part of the insomnia puzzle is to just slow down and find quiet. That is precisely why you want to start using meditation for sleep and insomnia, because it stops 90% of the root causes of insomnia. Many people have told us how much quieter they feel after they use our beginners guide to meditation. Insomnia is often caused by depression. And meditation can stop depression. People with depression often suffer from ruminating thoughts while they are in bed. These depressive thoughts prevent the mind from relaxing, which makes sleep next to impossible. And at the same time, sleep deprivation increases negative thinking. This is why approximately 20% of people with insomnia also have depression (8). Meditation trains the mind to be more aware of thoughts and feelings, and this reduces the effect of those thoughts and feelings. Read my guide to controlling your emotions. That’s just one reason to use meditation for insomnia. Anxiety is very closely linked to depression. Spiritually speaking, anxiety and depression are caused by a block of prana in the body. This can make it feel as though you are stuck or trapped. This could be caused by an emotional block, chemical block, or a blocked thought or mental pattern. Blocked prana can lead to both anxiety and depression (and numerous other problems). But meditation can free the low of prana to restore health. One way to restore the flow of prana is to use chakra balancing meditation. Insomnia can be caused by noise but it can also be caused by numerous other conditions. That’s why one of the bet strategies for dealing with insomnia is to focus on achieving good overall health. Meditation creates overall wellbeing, leading to good sleeping habits. There are over 100 health benefits of meditation. Therefore, if insomnia is being caused by a health condition there is a very good chance meditation will solve the problem, or at least improve the condition. For instance, meditation can be used to cure skin problems. Because meditation increases the circulation in your body it will increase the flow of oxygen and nutrition into areas that have skin problems. So if insomnia is being caused by skin problems, meditation will help. Another common cause of insomnia is breathing problems. Asthma, for instance. Meditation helps improve the quality of breathing, relieving the symptoms of respiratory problems and helping us get to sleep at night. Scientists are very quickly learning that meditation heals many health problems. So if you have a health problem that is causing insomnia, you should definitely consider using meditation for sleep. 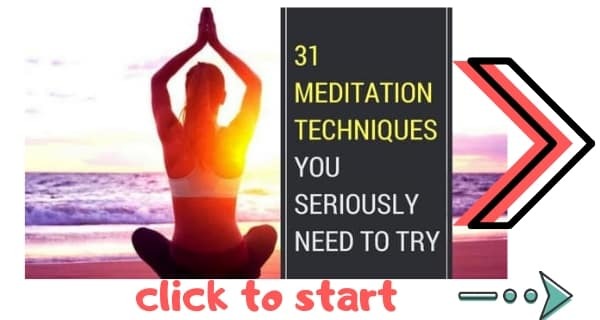 There are 31 major types of meditation. Some help with insomnia. Some meditations cause insomnia (read below). Before bed, use these 5 meditation techniques for sleep. And remember that there is a correct way to meditate while lying down! One of the main causes of insomnia is the inability to let go of thoughts in order to let your mind switch off. And one of the main benefits of meditation is that it helps you to let go of those thoughts. All those time when you’re lying in bed with your mind running a mile of minute. You know, those times you want to slam your head into the wall. The times when it feels like just going to sleep would be a miracle. At those times, mindfulness will be your new best friend. To give a brief introduction. To use mindfulness for sleep, first get into bed, give yourself a few minutes to begin to relax, then focus on your breath. While focusing on your breath, allow thoughts and feelings to be released. You know what’s better than Breathe Right Strips? Meditating on the breath. Shallow breathing promotes stress, making it hard to sleep. Deep breathing promotes inner calm and relaxation, helping us to get to sleep at night. One of the best ways to get to sleep is to make sure you are breathing correctly at all times. When you have ten minutes, focus your attention on your breath and imagine air entering deep into your lungs and filling your entire body. This will make you breathe better, which will promote better general health and help to cure insomnia. A very effective insomnia meditation techniques for sleep problems in adults. Yoga is one of the best ways of relaxing both body and mind. Try one of the 28 types of yoga and you will sleep easier. You don’t need to be a yogi, either. In fact, you don’t really need to know much about yoga at all. Two hours before bed, spend thirty minutes doing some basic yoga asanas (poses) while focusing on your breath (doing “pranayama”). This will connect mind and body and calm both for complete relaxation that is perfect just before bed. If you would like to learn more about using yoga for sleep, I highly recommend the work of Dr. Rubin Naiman. Dr. Naiman is a sleep specialist and a true luminary. His work on yoga for sleep is a true eye opener and offers genuine relief for insomniacs. I recommend The Yoga of Sleep: Sacred and Scientific Practices to Heal Sleeplessness [AMAZON]. Listening to music or listening to a guide meditation will help sleep. A guided meditation is designed to take you on a relaxing, imaginary journey. For instance, walking by the sea or floating on a cloud. Guided meditations can be done by either using a recording or by leading yourself through an imaginary scene. Imagine that you are somewhere safe and relaxing. And visualize all the details of that relaxing scene. See the sights. Hear the sounds. Smell the aromas. Let your mind bask in this wonderful relaxing scene. 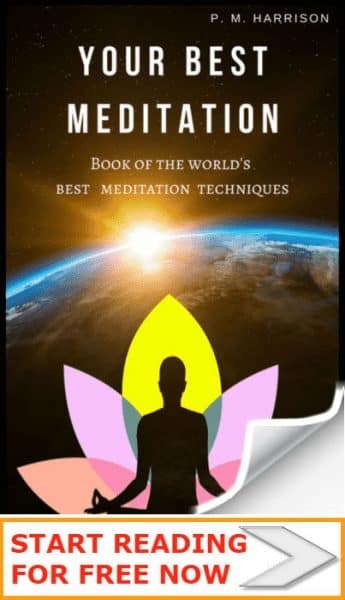 If you would like to use a recorded guided meditation, I highly recommend Jason Stephenson’s Guided Sleep Meditation [AMAZON]. Jason has a very relaxing voice and is a truly talented guide. This is one of the easiest insomnia meditation techniques for sleep problems in adults. Listen to meditation music before bed to relax your mind and help yourself to drift off. Relaxing music can help you get to sleep. Not only can you put some music on when your girlfriend (or boyfriend) is lying next to you snoring, but you can also use music to get into that Zen-sational chill-out zone that you want to be in before you hit the sack. Alternatively you might like to use a relaxing app. 6: Alternative meditation for sleep: use mantras before bed. Those 6 are how I cured my chronic insomnia naturally. One of the main reasons why thoughts continue to flow through your mind at night is because you want to remember them. The easiest way to solve this problem is to write the thoughts down. Grab a piece of paper and write them down or you an app like Evernote. Do you find that the moment you leap into bed your mind is suddenly overrun with thoughts? If so a simple visualisation can help to clear your mind. Imagine that you are standing at the edge of a beautiful ocean with the sea breeze in your ear. Now, when thoughts come to your mind, imagine tossing them out of your mind and into the ocean, where they drift away. When you exercise, your body gets tired and you’re less restless at the end of it. Same deal with your mind. If you spend an hour doing an “intense thinking workout” before bed, your mind will be tired and no longer restless. An Intense Thinking Workout (in which you intentionally force yourself to think about all the things that are in your mind) will help your mind to shut off. Guys, there’s bad news too I’m afraid. Obviously you want to use meditation for insomnia, yes? But some meditations cause insomnia. 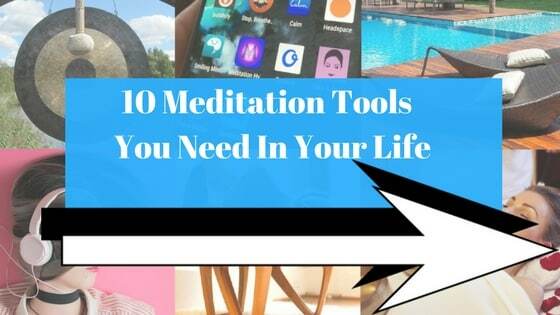 There are some very specific reasons why I chose those specific meditation techniques for sleep (above). So why are they the best meditation techniques for sleep. Simple: They relax the mind without bringing up anything unsuitable for bedtime. Some meditations (Vipassana, for instance) can make you aware of problematic thoughts, and these meditations can cause insomnia. The best meditation techniques for sleep are ones that relax you without doing anything intense. Guided meditations, music etc. Not advanced technique like Kundalini. 60 million people in America alone suffer from insomnia. So it is very likely that someone you know (or you yourself) has insomnia. Meditation will help. Meditation is a safe, healthy, positive way to cure insomnia. And science proves it works. While some meditation techniques cause insomnia, others can cure it. That’s why you should only do the above 5 meditation techniques for sleep. And now you can get to sleep, ,why not have a lucid dream. Share this article and let’s stop insomnia for good.